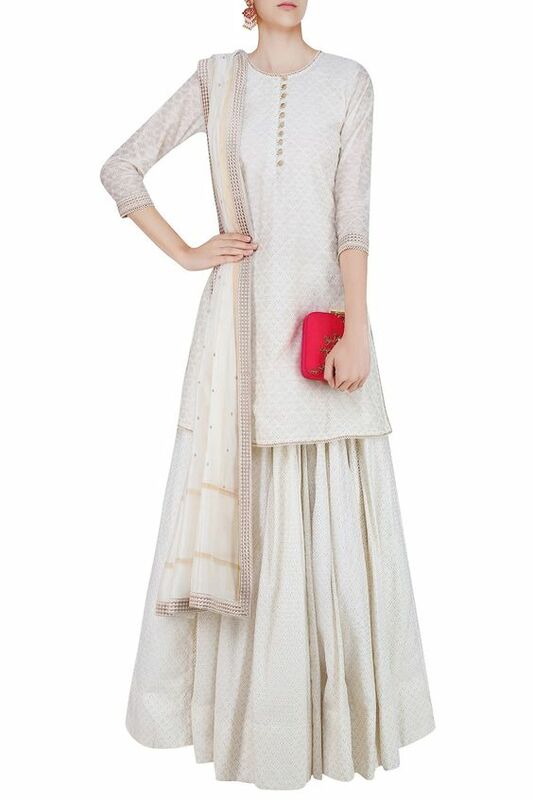 A plain white kurta is one of the must haves in wardrobe for any Indian girl. Not only it looks great for achieving a simple traditional look, but is also a great option for a fusion look. One advantage is that it can be accessorized in so many ways and always turns out to be great. Throw a colorful Polki or Thewa jewelry with it or match it up with a oxidized vintage jewelry for a muted look and it will never fail to impress. 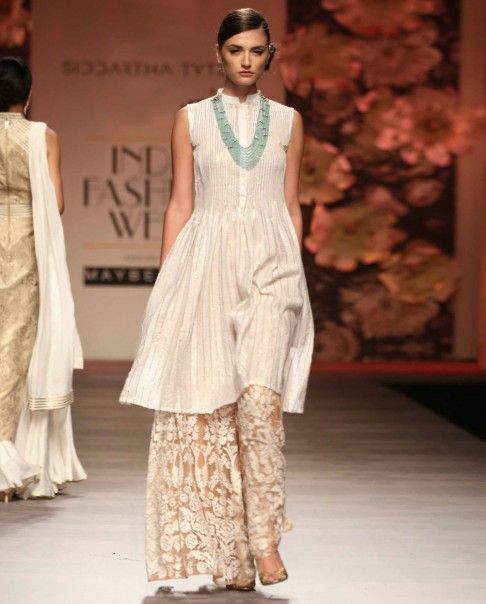 Well here are few different ways to look great in a white kurta…. Combine it with brocade– Brocades come in beautiful colors and patterns and have a distinctive shine on them. They go nicely with the white base of the kurta and you can play with different shades like bright orange, fuscia, red, purple for a brighter look and olives and black for a subtle look. Get them stitched in salwars, pants, palazzo or skirts according to your comfort. 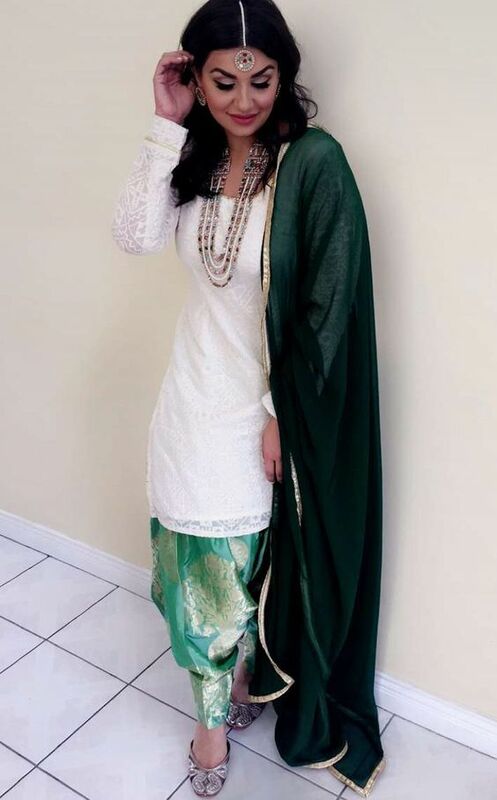 Get a all white look with a skirt– The best thing with the skirts is that they can be paired with both long and short kurtas, so you don’t have to worry about the length. If you are flaunting an all white style, then break the look by adding a red clutch or by wearing a red lipstick for a gorgeous look. Embroidered or printed palazzo– Pair your plain white kurta with a embroidered or a printed palazzo in tone on tone shades. The embroidery or the print will become the highlight of the garment and the muted tone on tone colors will save it from becoming over the top. Denims look great too– Pair white kurtas with your favorite pair of denims for a fusion look. You can further enhance the look by wearing a golden footwear, flats or heels it’s upto you. They look great with the muted look of a white kurta. Wear it with a traditional dupatta– Traditional dupatta’s are a great pair to pep up any plain kurta. Use a bright colored handwoven or handpainted dupatta and see yourself turning into a complete diva. You can go in for Handwoven dupattas in Chanderi, Maheswari, and Brocades, and block printed dupatta’s look awesome too.